25 illegal buildings have been torn down by Sanya law enforcement officers on Tuesday at Lizhigou Area in a bid to clear up tunauthorized structures built on public lands across the city. The 25 illegal structures, covering an area of 15,000 square meters, stand in lines and are designed to function as shops and hotels. In May 2011, the relevant department started to conduct an investigation on the 25 buildings and found them as illegal structures without official construction licenses. Despite government persuasion, some of the owners continued to have their structures expanded. 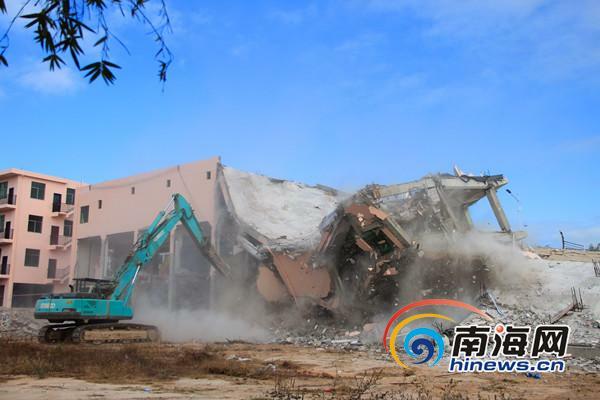 According to the officials, Sanya will continue its hammer action on the demolitions of illegal structures built on the land of the city’s 54 key projects over the next three months.